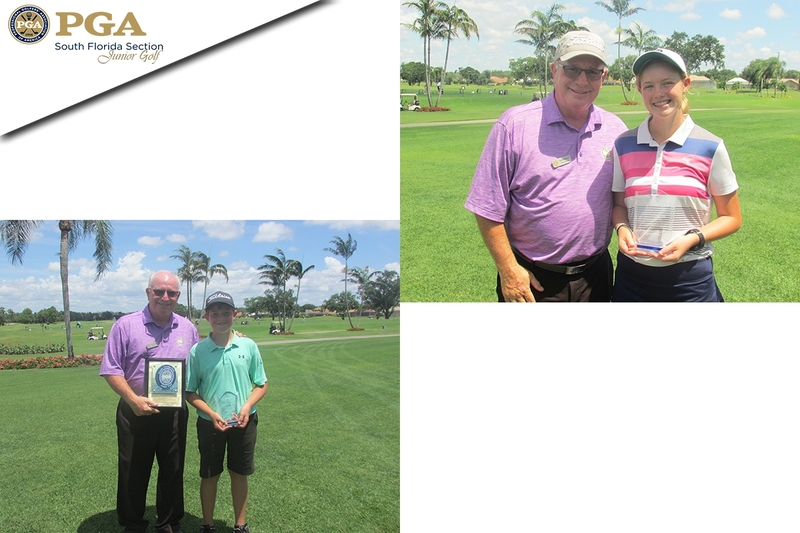 May 6th 2018 - ATLANTIS, Fla. – This weekend, the South Florida PGA Junior Challenge Tour presented by The Honda Classic held Challenge Tour Event #4 at Vineyards Country Club in Naples, FL on the South Course. The weekend featured great weather for the juniors. Miami native Hans Risvaer opened up round one with a 2-under-par 70 to take the early lead in the boy’s 13-18 division. Risvaer’s round featured four birdies to just two bogeys on Saturday. Stuart native Cooper Carmody made a run during Sunday’s final round. Carmody was 1-under-par heading to the 17th tee, and with one stroke made it 3-under par. Carmody aced the par-3 17th hole and finished the day at 3-under-par 69. Risvaer managed to grind out a 2-over-par 74 to hold off Carmody and capture the Overall Boy’s Title. Oliver Rotermund of Palm Beach Gardens took home the boy’s 13-15 age division, while Carmody took home the boy’s 16-18 age division. Jackson Langer of Coral Gables took home the boy’s 11-12 age division. The girl’s 13-18 age division featured an exciting finish this weekend. Angelica Holman of Fort Pierce opened up round one with an 80, but had a career day on Sunday. Holman fired a final round 1-over-par 73 to post 153 for the weekend. Kelly Shanahan of Coral Springs, who was playing in the final pairing after an opening round 75, fired a final 78 to tied Holman for the lead and force a sudden death playoff. During the first playoff hole, Holman’s tee shot ended up behind a tree. The youngster hit an incredible recovery shot short of the green and saved par to match Shanahan. On the next playoff hole, Holman found the water hazard and Shanahan was able to secure the victory with a par. Holman took home the girl’s 13-15 age division, while Naples native Sophie Shrader took home the girl’s 16-18 age division. Gloria Nip of Port St. Lucie took home the girl’s 11-12 age division.